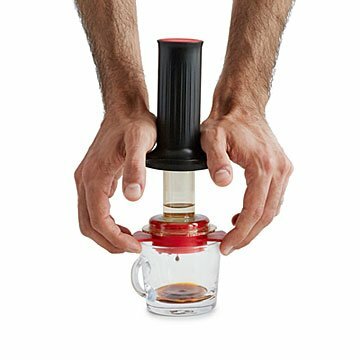 Make delicious, authentic espresso by hand anywhere, even camping, with this clever portable device. Real espresso. Nothing like it. But you can't make it at home without a big, expensive machine. Try toting that along on your travels. With this lightweight, handheld maker, you can make great, authentic espresso just about anywhere. With a simple squeeze, you create nine bars of water pressure—the magic number for a perfect shot, according to the Sages of CoffeeLand. Put coffee and hot water in the chamber, then push the piston down while holding the side handles. That's it. Your coffee, complete with crema (that deliciously golden foam), is ready. The espresso maker weighs less than half a pound, requires no filters, is easy to clean, and fits easily in a cupboard. Bring it camping, to work, or keep it at home for an authentic brew any time you want. Make lattes, macchiatos, iced Americanos, affogato (vanilla gelati "drowned" in hot espresso), or drink it plain, to enjoy the pure taste of your great coffee beans.